There’s one position in each team sport that requires more mental toughness than all of the rest. In football it’s the quarterback, in basketball it’s the point guard, in hockey it’s the goalie, and in baseball it’s the pitcher. With pitching comes the relentless pressure of knowing that you are one mistake away from single-handedly losing the game for your team. Whether it’s a defense mechanism to cope with this stress, or simply a job requirement, major league pitchers, especially lefties, are generally the weirdest players on the field. 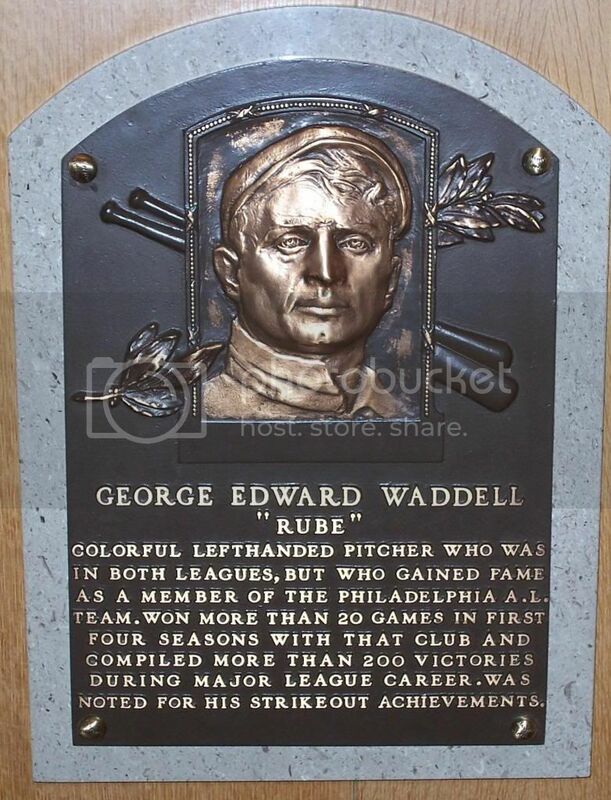 And the oddest of the bunch was Philadelphia Athletics’ pitcher, Rube Waddell. A harbinger of things to come, George Edward Waddell was born on Friday the 13th in October of 1876 in northeastern Pennsylvania. He learned his craft on nearby farmland by throwing rocks at crows trying to poach seeds as they were being planted. Waddell developed farm boy size and was soon dominating the local youth baseball league. When he was 19, he earned a spot on Butler’s local semi-pro team anddisplayed an overpowering fastball. He also displayed a childlike rawness that reflected his provincial background. When he started playing, he would bean any runner who hit a groundball back to the mound instead of forcing the player out at first, explaining “hit the batter and he’s out where I come from.” Discovered by a traveling salesman in 1896, Waddell was offered a job on the Franklin Braves in the newly-formed Iron and Oil League. When Waddell arrived in Franklin, catcher Jack Nelson gave him the nickname “Rube,” which was reserved for hicks and it stuck immediately. Although there was no questioning his talent, Waddell’s head was often somewhere other than in the game. He would leave in the middle of games to go fishing, or, if a firetruck passed the field he would run off and chase it. He would also go on drinking benders and disappear for days on end. After Franklin folded, Waddell’s next opportunity came with Volant, a local college. Volant made Rube an offer he couldn’t refuse: free tuition and room and board, in addition to $1 per game and free tobacco. At Volant, both his skill and his eccentricities were on full display. He was absolutely dominant as the lefty had developed a sharp curve ball and great control. He averaged 15 strikeouts per 7-inning game. 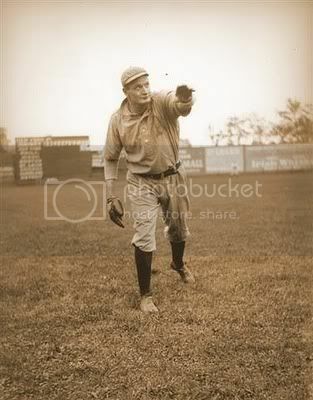 More than once, Rube called for all of his players to the leave the field and pitched with no defense behind him. Waddell would celebrate three-strikeout innings by cartwheeling, or walking on his hands, or somersaulting off the field back to the dugout. With these antics, he soon caught the attention of major league baseball teams and signed with the National League’s Louisville Colonels in 1897. However, he lasted just two games and left after being fined $50 for drinking, which had by this time become a major problem. Over the course of the next few years, he split time between the majors and the minors. In 1902, Connie Mack took a risk on the oddball and signed him to the Philadelphia Athletics. As an Athletic, Waddell immediately turned things around and put up unreal numbers in 1902 en route to clinching the franchise’s first pennant. His first start came on June 26th, 51 games into the season. Appearing in only 33 games that year, he compiled a 24-7 record, a 2.05 ERA, led the American League with 210 strikeouts (50 more than runner-up Cy Young who appeared in 100 more innings than did Waddell). He also pitched baseball’s first immaculate inning on July 1st. Over the course of Waddell’s career in Philadelphia, from ’03-’07, he won 21, 25, 27, 15 and 19 games respectively. His ERA with the A’s was a paltry 1.97 with a low of 1.48 in 1905. During that season, Waddell was motoring along until he got into a fight with a teammate over a straw hat and injured his throwing shoulder. This injury cost him the last month of the season, including the World Series. (Phillies owner Horace Fogel said Waddell was absent because he was paid off.) From ’04-’07 he pitched at least 7 shutouts per season. He also led the majors in strikeouts over 5 consecutive seasons. His record of 349 ks in 1904 stood for 60 seasons until Sandy Koufax struck out 382 in 1965. Waddell’s turnaround was a direct result of Connie Mack’s managing. According to Mack, Waddell “had more stuff than any pitcher I ever saw. 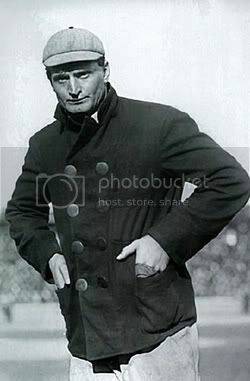 He had everything but a sense of responsibility.” Because of this, Mack paid Waddell on an as-needed basis in singles so he wouldn’t blow his earnings on alcohol. While Mack could control Waddell’s paychecks, he couldn’t control all of the idiosyncrasies. Waddell’s fascination with fire departments continued throughout his time with the A’s and he routinely wore red under his clothing just in case a fire bell would ring. He missed starts because he was fishing, or was late to games because he was playing marbles in the streets of Philadelphia with children. He was married three times and was often put in jail for missing alimony payments. He began that year sleeping in a firehouse in Camden, New Jersey, and ended it tending bar in a saloon in Wheeling, West Virginia. In between those events he won 22 games for the Philadelphia Athletics, played left end for the Business Men’s Rugby Football Club of Grand Rapids, Michigan, toured the nation in a melodrama called The Stain of Guilt, courted, married and became separated from May Wynne Skinner of Lynn, Massachusetts, saved a woman from drowning, accidentally shot a friend through the hand, and was bitten by a lion. He wrestled alligators during the off season. He played for two Philadelphia Athletics clubs in 1902: the baseball club and the Philadelphia Athletics of the first National Football League (at 6’2″ and 200 lbs. he was a fullback). He almost shot Connie Mack in the head when a pistol fell out of his pocket and fired at the team hotel. His contract included a clause, at his catcher’s insistence, that prohibited Waddell from eating crackers in bed. During the early years, players would share beds on road trips and Ossee Schreckengost couldn’t sleep because of the crumbs. In 1903, he climbed into the stands to beat up a spectator who was heckling him and was suspended for 5 games. At the end of the 1907 season, Waddell was slumping badly and was then sold to St. Louis “in the interests of team unity.” He pitched out the final three years of his major league career before drinking his way back to the minors in 1911. The events surrounding Waddell’s death were just as memorable as those surrounding his life. In the fall of 1912, he was living in Kentucky with friends when a nearby dam collapsed and caused devastating flooding in the region. Waddell immediately went to help out in whatever way he could, by pulling people out of homes and by working for hours on end in cold water piling up sandbags. Although his actions were herioc, they also proved costly as he developed pneumonia. As a result, his body was severely weakened and he battled bouts of pneumonia and tuberculosis from which he never fully recovered. He died in 1914 at the age of 37…on April Fool’s day. In 1946, he was enshrined in the Hall of Fame. By all accounts, Waddell was known much more for his eccentricities than for his talent. But there is no doubt that the former rivaled the latter as Waddell was one of the greatest pitchers in baseball history.